To cite: Bibu Prasad Routray. “Leftwing Extremism 2017: Sparks from a Flailing Revolution,” NIAS Strategic Forecast No. 20. Bangalore: International Strategic and Security Studies Programme, National Institute of Advanced Studies, April 2017. 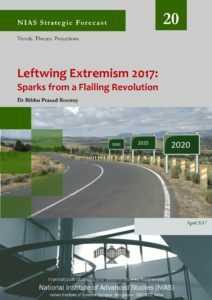 Shrinking presence of the left-wing extremists, their reduced ability to orchestrate attacks and produce dead bodies of civilians and security forces; and the state’s ability to find support among the traditional recruitment base of the Communist Party of India-Maoist (CPI-Maoist) – all these are reasons for official optimism regarding the LWE situation in the country. How is the LWE situation likely to evolve in the country in 2017? This has been analysed from the three important perspectives – state attempts to quell the extremist rebellion, the extremists’ attempts to revive and reorganise their fight, and the aspirations of the people- providing a comprehensive account of how the LWE situation may unfold in 2017. About the Author: Bibu Prasad Routray is Director at Mantaraya.